Trying to figure out how YouTube’s one billion monthly users are interacting with your videos? Try the new YouTube Analytics API to get custom reports of the YouTube statistics you care about in a direct JSON or CSV response, perfect for dashboards and ad hoc reports. Watch metrics: Track estimated minutes watched across channel, content owner, or video, and dive into the video details with average view time and average view percentage. Annotation metrics: Optimize overlays/annotations with click through and close rate metrics. You’ll find client libraries for the languages you use most, with nine different languages available today. You can also make HTTP RESTful requests directly, and with our API Explorer, you can try out sample reports before writing any code. Next Big Sound provides analytics and insights for the music industry by tracking billions of social signals including YouTube. This enables record labels, artists, and band managers to make better decisions on everything from promotion strategies to tour locations. vidIQ is an audience development suite that works with global brands to organically grow their views and subscribers. Their features include cross-platform social analytics, advanced comment management, SEO tools, social syndication and influencer identification. Wizdeo’s WizTracker provides in-depth analysis of YouTube channels to help with cross promotion and video comparisons during their initial launch. Users get access to detailed analytics about views, subscriber engagement, traffic sources and demographics. Vidyard is a video marketing platform. With powerful analytics, built-in marketing tools, and integration with key marketing automation platforms, Vidyard helps marketers drive results with video content. 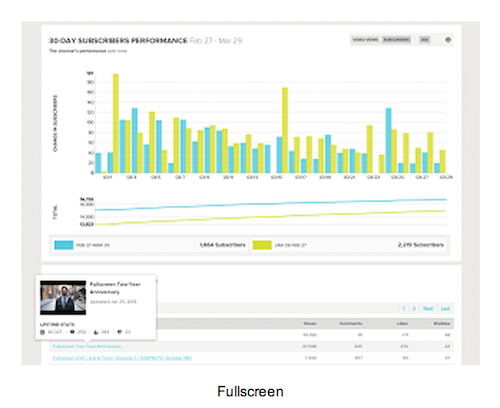 Fullscreen is building a global network of YouTube channels with content creators and brands. Fullscreen provides a full suite of end-to-end YouTube tools and uses the new API for internal, business-intelligence tools. In addition to the documentation, check out our Analytics API playlist to make getting started even easier. If your goal is to export all statistics for a large number of channels on a recurring basis for your data warehouse, look forward to using the upcoming scheduled reports feature of the API, expected to launch later this year. To get more info on the YouTube APIs, subscribe to our YouTube for Developers channel and YouTubeDev on Google+. Ted Hamilton is the Product Manager for YouTube Analytics based out of Zurich, Switzerland. Prior to Google, Ted was a consultant at Bain and Company in London. Ted has a Computer Science degree from Northwestern University and holds an MBA from MIT Sloan.